The source of water is a series of 11 wells — seven vertical and four angled — that tap into the Missouri: Elk Point Aquifer adjacent to the Missouri River. The main wellfield is in an area known as Mulberry Point, just north of the Vermillion-Newcastle Bridge southwest of Vermillion, SD. It is part of SD Department of Game, Fish & Park’s Frost Production Area. There are three wells at Site A, three at Site C, three at Site D and two at Site E. One or more wells will be built in the future at Site B, and possibly elsewhere, as demands require. Most are a stone’s throw from the river bank. Protecting them from erosion is a one mile bank stabilization system called a “modified stone toe revetment”. This environmentally friendly approach to bank stabilization received the distinguished “Partners in Conservation Award” from the U.S. Secretary of the Interior in May 2009. Lewis & Clark also owns land a couple miles upstream for a possible secondary well field known as Site J, but it is not known when or if any wells will be drilled there. The first well drilling contract was awarded to Layne Western of Omaha in June 2003 and substantial completion was reached in December 2003. Final construction cost was $362,000. This contract was for one angle well and is the only one drilled parallel to the river. The other three subsequent angle wells were drilled perpendicular to the river. 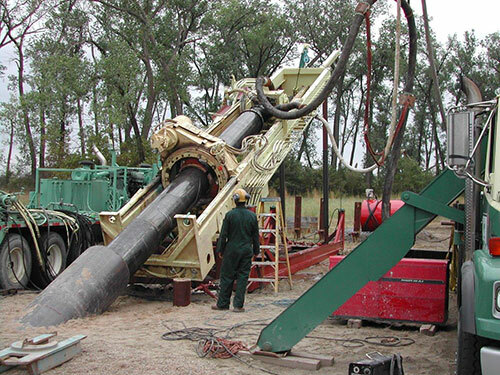 The contract was awarded to Sargent Drilling of Nebraska in August 2005 and substantial completion was reached in November 2005. Final construction cost was $59,000. This contract was for one test well and six observation wells a couple miles upstream at Site J. Based on the testing results the engineers determined when compared to the Mulberry Point wells neither the water production nor the quality are as high. It is unknown when or if production wells will be drilled at Site J. The contract was awarded to Traut Wells of Waite Park, MN in June 2006 and substantial completion was reached in October 2007. Final construction cost was $1.6 million. This contract was for three angle wells (two at Site C and one at Site D) and two vertical wells (one at Site C and one at Site D). The angle wells were drilled perpendicular to the river. The contract was awarded to Welfl Construction of Yankton, SD in September 2007 and substantial completion was reached in August 2008. Final construction cost was $5.3 million. This contract was for pump houses, vaults, piping and roads for the six wells at Sites C and D, as well as construction of one mile of revetment that protects the main well field from erosion. The contract was awarded to Welfl Construction of Yankton, SD in April 2010 and substantial completion was reached in December 2011. Final construction cost was $5.8 million. This contract was for five vertical wells (three at Site A and two at Site E), as well as the associated pump houses, vaults, piping, standby generators and roads. It also included equipping the six wells at Sites C & D with pumps, controls and standby generators. A close to $1,569,774 contract was awarded to Quinn Construction of Rapid City, SD in May 2017 to repair portions of the existing one mile of revetment that protects L&C’s well field from Missouri River erosion, as well as extend the revetment 2,100 feet. Construction will be completed before the end of 2017. Federal funds are being used for the extension ($1,079,432) and reserve funds for the repairs ($490,342). A $1.9 million contract was awarded to Welfl Construction of Yankton, SD in June 2018 for four vertical wells to replace four adjacent angle wells that are being abandoned. December 2018 is the substantial completion deadline for the first vertical well at Site C, and December 2019 for the other vertical well at Site C and the two vertical wells at Site C. The angle wells were decreasing in production and efforts to rehabilitate them were unsuccessful. In addition, the maintenance and repair costs of the angle wells were increasing. It was never the plan of project engineers to construct angle wells, but they were recommended as part of a Value-Engineering Review led by the Bureau of Reclamation. Unfortunately, the Value-Engineering Review cost money instead of saving money. Federal funding is being used for the replacement vertical wells, since in hindsight that is what should have been constructed. A collector well that hopefully will produce 16 million gallons a day, if not more, is being planned for Site B. Design of the collector well will start in the winter of 2019 and the current schedule is to bid the project in the fall of 2019. To aid in the design, data is needed from a 12″ test well and six observation wells. A $92,000 contract for these seven wells was awarded to Sargent Drilling of Geneva, NE in October 2018. The substantial completion deadline is December 2018.